Born on September 27, 1932 in Grand Rapids, Helen Marie Wysocki was the twelfth (not the tenth as her obituary stated) and last surviving child of Frank and Anna Wysocki. Her big brothers and big sisters were Julia, Joe, Andy, Stephanie, Ted, Edmund, Frank Jr., Felix, Virginia, and Walt. Sadly, Felix died after being struck by a car and an infant child died shortly after birth. If Aunt Stephanie’s notes are correct, then Anna would have been 48 years old when she gave birth to Helen. The Wysocki family grew as each child married. Julia married Leo Jenzen. Joe married Martha Gruszka. Andy married Clara Kolenda. Stephanie married Ben Prawdzik. Ted married Mickie Kozminski. Edmund married Fran. Frank married Dottie. Virginia married Zyg Uzarski, and Walt married Jean Cichon. Then nature took over and the family continued to grow and new families were created. Young Helen became an aunt before she finished elementary school at St. Adalbert’s and was an aunt many times over by the time she graduated from Catholic Central High School. After graduation from high school, Helen enjoyed attending the YMCA dances that were held at the Rowe Hotel. In 1951, she met a handsome, skinny fellow by the name of Bob Byrne, who was a college student at the time. Love blossomed, and Bob popped the question in 1952. 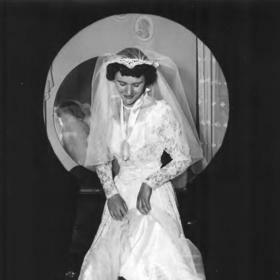 Helen said yes, and Stephanie made Helen’s dress for the June 20, 1953 wedding. 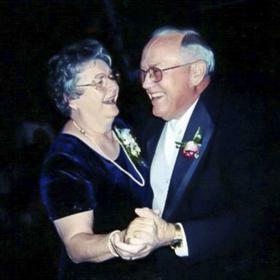 It was a “mixed marriage” between an Irish Catholic and a Polish Catholic, which caused some concern in Helen’s family, but it was the marriage of two people whose deep and abiding love for one another lasted fifty-nine years until Bob’s death in 2012. Bob gave Helen a silver dollar so that no matter what came their way, she would never be broke. She died with that silver dollar in her possession. Helen’s best and life-long friend from elementary school was Delores “Dee” Dennis, who later became Dee Teska in 1956 when she married Gordon Teska. Dee was Helen’s maid of honor when Helen married Bob. The two couples experimented with various barbeque sauces, always searching for the perfect taste. They tried making the latest cocktails, like Tequilla Sunrises and Harvey Wallbangers. Dee died in 2011, but Gordon and Helen have always stayed in touch. After living in an apartment on Milwaukee Street NW, Bob and Helen bought their first house on Jerome Street SW. At that time, their family included Ann, Don, and Kevin. The back yard was terraced, and Helen built a snow sled ramp from the upper yard to the lower yard, much to the delight of her children. Helen had Bob build ice rinks in the upper yard and Helen taught her kids how to skate. Ice skating was a passion for Helen and she avidly watched the competitions on television every winter for as long as she lived. By the time Mary arrived, the Jerome Street house was a tad tight, so the family moved to Lafayette SE. The Lafayette house was close to Garfield Park, which had a huge swimming pool, a wading pool, a playground, and a large ice rink with access to a warming house in the winter. There were lots of activities to keep her brood busy whatever the season. The brood grew to include Ken, John, Jan, and Peter. Helen and next door neighbor, Jeanne Hatch, started a business making fancy sandwiches, which were quite popular at the time. Helen joined the Altar Society, keeping St. Francis Xavier Church in tip top shape, despite the challenge of keeping her own home clean and orderly. She became a room mother and got increasingly involved at St. Francis School. Yet Helen always made the time to write long letters to her friends who had moved away and to family members like her niece, Betty, who lived in California for a number of years. How she managed to keep up such extensive correspondence in between the many loads of laundry that always had to be done remains an unsolved mystery. Bob taught Helen to drive on a driving range at South High School, and we were all in the station wagon when she took her driving test. Who was more afraid – Helen or the guy who had to get into the car with all those kids to test her? When Helen applied for her very first driver’s license, she had to get a copy of her birth certificate. That’s when she was shocked to learn that her first name was listed as Ellen. Whether she got the birth certificate corrected or got a name change from the court, that first driver’s license said Helen was her first name when she eventually got it. Helen’s Grand Rapids based siblings, their spouses and their children kept up a tradition for many years of visiting each others’ homes between Christmas and New Year’s Day. Each sibling picked an evening to make short visits to the other siblings’ houses. The tradition appears to have come to a halt when Bob and Helen moved to Jenison because that’s where the earth ended. (What is now I-196 ended at Chicago Drive in 1971. It wasn’t until years later that the expressway continued on to Holland and then to I-94.) Or maybe it was because Jenison was dry, necessitating a trip to Grandville to purchase beer and booze. Maybe it was a combination of the two. The 1971 move to Lilac Drive in Jenison marked many changes for Bob and Helen. St. Pius X was their new parish until they and a number of other families helped found Holy Redeemer Parish in Jenison. Kevin, Mary, Ken, John, Jan, and Peter all went to Jenison Public Schools. There were still lots of activities like football, basketball, water polo, cheerleading, and even ski club. Slowly the house started to empty year by year as children went off to college. Then kids started to get married. Then grandchildren began arriving. Grandchildren brought a whole new joy into Helen’s life. She loved to cuddle with them when they were infants and play with them as toddlers. As the grands grew older, Helen treated them to backwards dinners that started with dessert and ended with even more dessert. The luncheon after Helen’s funeral Mass will start with dessert as a tribute to backwards dinners. Helen learned to use Facebook and Facetime so she could stay in touch with her grandchildren and the great grandchildren that followed. Her first computer was a little candy apple red model that she used until 2012 when she inherited Bob’s computer and joined the big leagues. After Peter moved to Utah, Bob and Helen moved into a condo in 1992 and then moved to Sun City, Arizona from 1997 to 2004. Helen volunteered at a hospital and had a million other projects keeping her busy. She and Bob traveled the western states, hosted visiting family members, and enjoyed their retirement. 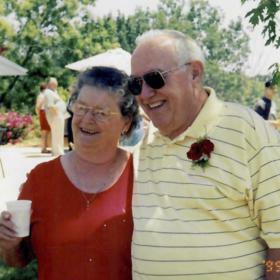 Upon their 2004 return to Grand Rapids, Bob and Helen bought a condo in Walker where Helen lived until 2018, staying even after Bob’s 2012 death. 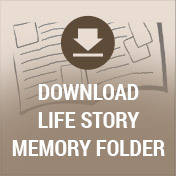 In July 2018, Helen decided that she wanted to live in assisted living at St. Ann’s Home. She found high school classmates residing there and made new friends among the other residents and staff. She relished her independence and freely dispensed hugs along with Tootsie Rolls and other candies. Helen has left this earth, but her love endures. Her love was patient and kind. It spread widely among many people. We are grateful for this generous gift, will treasure it, and will share it. 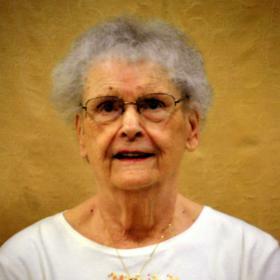 Helen Marie Wysocki Byrne died peacefully on February 10, 2019 at age 86, surrounded by her children and several of her grandchildren. She was the last survivor of Frank and Anna Wysocki's ten children. Her husband, Robert J. Byrne, and her beloved grandson, David Alan Szumski, also preceded her in death as did so many dearly loved siblings, family members, friends, and acquaintances. Helen is survived by Ann M. Byrne and Timothy McMorrow, Donald and Mary Byrne, Kevin and Karen Byrne, Mary and John Szumski, Kenneth and Beth Byrne, John and Maureen Byrne, Janice Davis, Peter and Grace Byrne, 31 grandchildren, 20 grandchildren's spouses or soon-to-be-spouses, 39 great grandchildren, and 5 more great grandchildren waiting to be born. 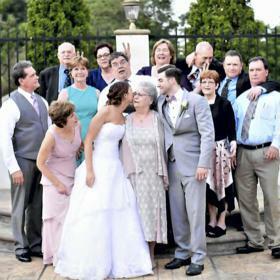 In addition, Helen is also survived by Jean Wysocki, Sandy Byrne and Ron Neiderheide, Rose DeBoer, Patrick Byrne, James and Sandy Byrne, Kate Byrne and Bill Cavellini, and a multitude of nieces, nephews, their spouses, their children, and their grandchildren. Helen captured the hearts of and will be missed by the aides, nurses, staff, and many residents of St. Ann's Home where Helen made her home since July 2018. Helen's many other friends will miss her engaging smile, her warmth, and their chats with her. Helen loved family dinners, her once-a-month wine highballs, chocolate, and desserts. She treated her grandchildren to backwards meals that started with dessert and ended with still more dessert. She was always happy to see you, wanted to know how you were doing, and what was new in your life. She hugged. She dispensed candy. She loved abundantly and without reservation. She lived her faith. Nothing made her happier than to hold a grandchild or a great grandchild on her lap and to cuddle with that child. On occasion, she got her back up and swung into action to right a wrong. She always sent thank you notes, cards, and letters to those she loved. She learned Facebook and Facetime so she could stay in touch. She gracefully adapted to her world as it changed over the years. Her greatest gift was freely dispensed to all in her world and that was her love. Please come share that love and have a bite to eat at Helen’s visitation, which will be held from 4 to 8 pm on February 12 at the Alt & Shawmut Chapel at 2120 Lake Michigan Drive. There will also be visitation at Holy Spirit Parish at 2230 Lake Michigan Drive on Wednesday, February 13 from 10 to 11 am followed by a Mass at 11 am honoring her faith in God and her new heavenly life. For those who desire, memorial contributions may be made to St. Ann’s Home, 2161 Leonard NW, Grand Rapids, MI 49504. Please write Helen Byrne on the memo line of your check.